How do you sport (support) DotNetNuke? So, beyond my life with DNN I have other hobbies, mainly revolving around cars and racing. I autocross my car, and this past weekend was the first SCCA National Tour for 2008, held down in southern Georgia. Me and a friend made the haul from St. Louis to try to get the rust off and start out our season facing off against some of the fastest drivers in the country. Generally you wouldn't start out your season at a large event such as a National Tour, but it has been almost 4 months since my last race so I was itching to get started. It was a great weekend, it quit raining just in time for the racing to start and the sun came out so it was warm enough for shorts, which it hasn't been here in St. Louis for 3-4 months now. The racing went well, I managed to get the 6th and final trophy position, out of 18, in my class. I was happy to have performed that well for the first event of the year and only the second event in my new car. You might ask, why is he talking about car racing here on DotNetNuke.com? Well, take a look at this photo of me and the car taken Sunday afternoon before we loaded the car back up on the trailer to tow home. I figured I might as well sport some DNN logos while I was racing this year! 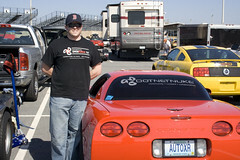 That's how hooked I am on DotNetNuke, I put a big DNN logo on the back window of my car. If you're in St. Louis keep an eye out as the logo might pop up a few other cars if I get bored! So, how do you show your support for DotNetNuke? Anyone got a DNN tattoo yet?